I'll read anything about ultra running. I'm a bit boring like that. There is a lot out there nowadays, probably more than I could ever read. Here is a list of "suggested reading" that I would recomend to anyone who has yet to pick up a book on the subject. OK I don't believe the way to get good at running ultras is to read a book and then follow those instructions to the letter. This is fine for Triathlon and flat pack cabinets but long distance running is something so part of our nature that there are a million different ways of being successful and it really is a case of finding your own way. It's just like writing a book about how to be successful with the ladies. Has anyone ever written such a book? Impossible. That said I think the best starting point if you are new to this game or want a general reference is Bryon Powells very good book Relentless Forward Progress. It contains great discussions of the major things you should be aware of before starting out on running all day and all night such as nutrition, hydration, temperature control, kit, shoes and pacing. It does also include training plans if you are at a total loss as to what to do. The best all round guide I have come across. My review is here. Bryon also runs a website irunfar.com which is a great source of info and debate about all things ultra. Bernd Heinrich is probably the Indiana Jones of ultra running. His scientific research and ultra running credentials are amazing and this book is an absolute must read for anyone into distance running and the science behind it. How does a bumble bee or a moth flap it's wings 1000s of times a minute and not overheat? The thing should turn into a ball of flames. How do birds manage to fly 3000 miles non-stop over several days without re-fueling? How can a Pronghorn Antelope run 10k in 7 minutes? What kind of VO2 Max would that require? He pondered all this while trying to break American ultra distance records. His experiments were a joy to read (especially the one involving beer). I like books that reassure me that what I do is normal and sustainable. I liked this book a lot. Awesome Book - Mike Stroud is the guy who does all those amazing adventures with Ranulph Fiennes, he is a doctor and has a lot to say about training and the human body. Another book I am naturally bias towards as it evangelises fitness and makes another good case for running being the natural thing. One this different about this is that it says running in the heat is normal. So no complaining about the British Summer. But the adventures go elsewhere, in an unsupported trip across Antarctica. Pulling a sled full of lard he and Ranulph went for months in the coldest places on Earth and discovered new levels of human capability. I like it when people tell me that things are much simpler than others make out. I liked this book immediately, every page seemed to just say cut out the complexities of what you have done before and keep it really simple. There were a lot of other gems in this and would definitely suggest reading it. It's funny because his previous book "Brain training for runners" finished off with the usual appendices of training plans for you to stick to. This time he suggests you wing it a lot more. So for example if you are supposed to be doing a hard run but don't feel like it's working then you can ease back and call it a recovery run. Vice versa if you are running easy and feel like smashing it then you should go for it, so long as you get a good combination of speed/recovery/long/hill etc runs in. This is a real game changing book that generated a huge amount of discussion a few years back. Basically everything we have been told about "if you are thirsty it's too late, you are already dehydrated" is wrong. There are a few simple messages in the book regarding drinking and salt consumption. Fascinating if you want to delve into the science of hydration. Ultimately it is a very long way of saying "drink when you are thristy"
The bible of footcare, not just for runners but for other sports too where you use your feet. So would be useless for American Football. I've met Mark a couple of times now, firstly on our ill fated attempt to run the UTSW 100 last summer. He is an endurance runner, adventurer and physiologist. His books brilliantly bridge practical advice and experience on running ultras in hostile environments with some sciency stuff about what such environments do to the body. I recommend any of these books for someone looking for advice about desert racing, arctic racing (something of a speciality of Mark's) and jungle racing. His books detail his own experiences of training for the Marathon Des Sables, the Yukon races and the Jungle Marathon. There are plenty of interesting chapters available on his website including this one on running in the heat. Awesome book. Still not reviewed yet but then you have all read it haven't you? Well obviously you have read this one too? It is an incredibly entertaining book and if you wanted a quick intro to the "crazy" world of ultra running. This is probably the best book of an elite ultra runner I have read. Her achievements are impressive, she won Badwater outright twice and ran 300 miles non-stop. She battled anorexia in her youth and was motivated to achieve great things. This is much more than an "I am awesome" book, even though she is. There exist a few books that "have" to be read in the same way that some ultras "have" to be run. Feet in the Clouds by Richard Asquith is one such book, one of a handful of books that every runner seems to have read. I am ashamed of myself for taking so long to finally start reading it. I am also ashamed that I was 30 years old before ever going to the Lake District. A boy from London trying to take on some of the spectacular hills of the Lake District by throwing gear and science at it. Sports drinks and fancy shoes and maps. It struck me like he had missed the point as to what it was do run on those fells, not that I really know. Reminded me of several discussions on my clubs forum in the winter that would start something like "I've noticed it's snowing outside. Obviously I can't just go and run in the snow but I have a spreadsheet to stick to so don't know what to do. Is there a piece of kit I can buy that will just make the snow go away?" Askwith is not one of these super athletes but takes on the challenge anyway. The account of his own personal efforts and failures makes great reading for those who want to make an attempt at this. I recommend going to the lakes though, it is beautiful but really hard terrain. "If you're not cold, or wet, or lost, or exhausted, or bruised by rocks or covered in mud, you're not really experiencing the mountains properly. You need to feel it, to interact with it; to be in it, not just looking from the outside. You need to lose yourself - for it is then that you are most human." His account is quite poetic and he kept a journal with him all the time to capture all of the events and thoughts he enjoyed (and suffered) along his 3100 mile 80 day adventure. He did the run as a "Journeyman", meaning self supported rather than being in a race. The majority of the runners who beforehand had completed this run across the continent have done so in an organised race. To this day there have been 270 known foot crossings. Shapiro was the 108th. Obviously the most awesomest book ever wroted. When it actually gets written..
It’s an easy one to miss as it’s so rare but anyone wanting to read the history of ultra-running up until 1980 should seek this gem. lots of great short stories and race reports, about 40 in total. I find that reading others experiences of races is a great way to pick to tips, advice, inspiration and experience and there is a lot of that in here. All levels are covered from elete to first timers. I think this was the first time I heard about a race called Barkley. 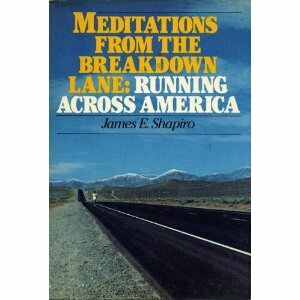 Another great collection of short stories about mainly ultrarunning. The Barkley Marathons in case you don't know is arguably the toughest race there is. It is 100 miles long (though most others measures of the course clock it at about 130 miles), it's 5 loops around some trails in the Frozen Head National Park in Tennessee. The climbing involved is around 18000m, or twice Everest or twice UTMB. The trail is often overgrown with briars (I think that is American for thorns) and there is no support in the race. Thus far 13 people have finished in about 20 years.